Brampton Island is perfectly positioned in the Whitsunday Island Passage just out from Mackay. It is ideal for a romantic escape or relaxing getaway from the stress of the big city. Around the island there are 12 white sandy beaches where you can have a secluded picnic with your special someone, as well as numerous walking tracks around the National Park. Brampton Island is an intimate retreat that provides holiday makers with a variety of island accommodation where everything is taken care of for you and all you have to do is worry about how to have a relaxing time. Only a short distance away from Brampton Island is a wide range of fringing coral reefs that allow you to view the amazing array of marine life that calls the Great Barrier Reef home. If you are looking for a special treat for yourself then why not have a rejuvenating massage, facial or body wrap in the island's Sea Spa. 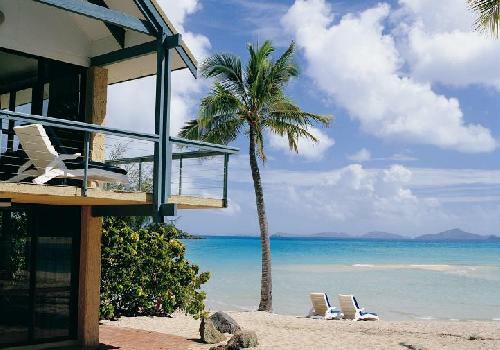 Unlike most of the other Whitsunday islands Brampton Island does not allow you peace and harmony to be disturbed by day trippers and the island itself has its own coral reef that is perfectly positioned just off the main beach. When you choose to holiday at Brampton Island you can make the most of the numerous activities and tours that are on offer, such as snorkeling on the Great Barrier Reef, guided rainforest walks, trips to Whitehaven Beach or even going for a picnic on a secluded beach. Other activities that you can do whilst staying on Brampton Island include scenic flights around the Whitsunday region, tube rides, snorkeling, fishing trips, spa treatments, sea kayaking, beach volleyball, walks around the National Park, fish feeding, tennis, aqua aerobics, surf skiing, table tennis and also enjoying the nightly entertainment at the resort.